Classic Confections- Salt water taffies, pastel party mints, peach or apple O’s, Jordan almonds, gummies (in a variety of flavors and colors), M & M’s, Hershey’s kisses and much more! A colorful display and custom fitted for your event. Whimsical- Ring pops, pixy sticks, Mega Gum Balls, Heart Lolly-pops, air-heads, Pop rocks, tootsie rolls, Army Guys, Freedom bears (red, white, and blue), lemon drops, assorted sours, triple dipped chocolate malted balls, YUMMY! Color Themed- Gourmet gummies, assorted sours, colored chocolate drops, sixlets, rock candy, hard candy sticks, jelly belly’s, foil wrapped chocolates and much more! The Ultimate Chocolate Bar- Truly a chocolate lovers dream in every bite! Chocolate malted Balls, Milk chocolate peanut clusters, chocolate pretzels, Hershey’s variety chocolates, raisins, almonds and macadamia nuts, milk duds… just to name a few! Attendant strongly recommended. Customer will assume liability on glass breakage if attendant is not contracted. Prices start at $3.75. 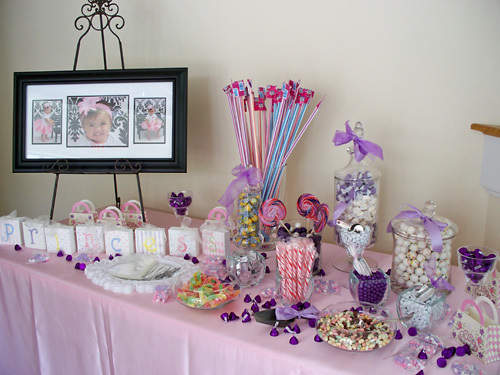 Each candy table is custom designed to each client, theme and colors. Additional props can be also added.